Mixed Martial Arts Fighter Kimbo Slice Dies At 42 : The Two-Way Slice parlayed videos of his street fights into a career as an MMA fighter. He reportedly died Monday at a Florida hospital of as-yet-undisclosed causes. 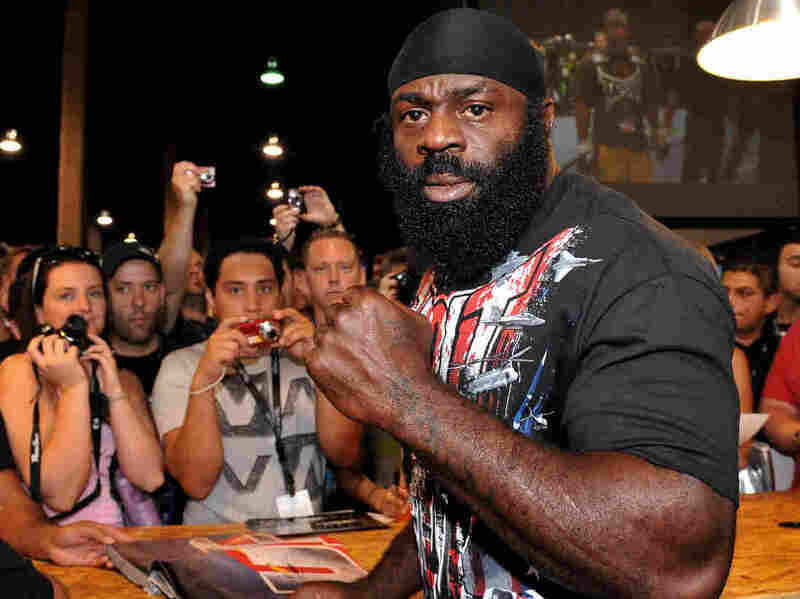 Kimbo Slice signs autographs at the UFC 100 Expo in Las Vegas in 2009. Slice died suddenly Monday at the age of 42. The world of mixed martial arts has suffered a heavy blow with the unexpected death of one of its best known athletes. Kimbo Slice, whose given name was Kevin Ferguson, reportedly died Monday of as-yet-undisclosed causes at a Florida hospital. He was 42. "Outside of the cage he was a friendly, gentle giant and a devoted family man. His loss leaves us all with extremely heavy hearts, and our thoughts and prayers are with the entire Ferguson family and all of Kimbo's friends, fans, and teammates." ESPN reports that Slice "had been hospitalized earlier Monday in Margate, Florida, for undisclosed reasons, according to Coral Springs police, who had been dispatched to his residence to prevent a potential gathering outside. They said no foul play was suspected." Slice parlayed online videos of his street fights into a career as an MMA fighter. He had such a large Internet following that in 2006, Rolling Stone dubbed him "The King of the Web Brawlers." This homage from ESPN was quickly retweeted more than 60,000 times. Slice was born in the Bahamas and grew up in Florida, playing football in high school. He burst onto the boxing scene in amateur street-fighting matches that were popularized on the Internet. In 2007, in his first official MMA fight, he defeated former heavyweight boxing champion Ray Mercer.